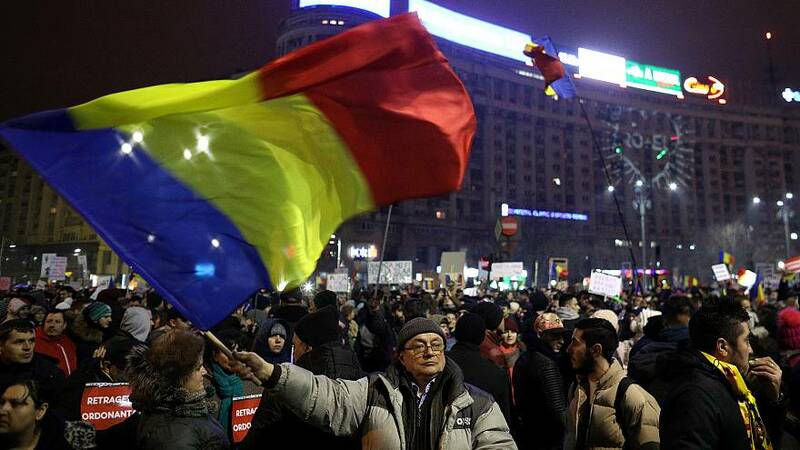 European countries have joined the US in urging Romania to scrap emergency legislation they say will weaken judicial independence and the fight against corruption. The rare joint declaration was signed by the ambassadors to Romania of Austria, Belgium, Denmark, Finland, France, Germany, Ireland, the Netherlands, Norway, Sweden and the US. "We are deeply concerned about the integrity of Romania's justice system, which has been buffeted by unpredictable modifications that do not further Romania's efforts to consolidate judicial process," the letter states. "To the contrary, the cumulative effect of these modifications carries the risk of slowing down the fight against corruption and undermining judicial independence. "The expected changes carry the risk of breaching common values," it also says. It came as the European Parliament chief Antonio Tajani launched his own attack on Bucharest over the detention of Romania's ex-anti-corruption boss Laura Kovesi. Kovesi, among the candidates to be the EU's first chief prosecutor, was banned from leaving the country or talking to the press. Romania's ruling Social Democrats (PSD) want to reduce the statute of limitations covering several offences, which would automatically put an end to several ongoing corruption cases. The other emergency ordinance would grant people convicted of graft since 2014 the right to retroactively challenge the Supreme Court's verdict. Critics say the measures will benefit politicians and high-ranking officials including Livia Dragnea, PSD leader and the most powerful politician in Romania. He was prevented from becoming prime minister following a 2015 conviction in a vote-rigging case and is currently appealing a second conviction for inciting others to commit abuse of office. Brussels also issued its own warning to Romania, which currently holds the EU's rotating six-month presidency. Frans Timmermans, first vice-president of the European Commission, told reporters: "I want to warn against any governmental action that would disrupt the Romanian judicial system by creating a systemic de facto impunity for high office holders who were sentenced for corruption." "Such a move would compel the Commission to act swiftly," he added. Antonio Tajani, the president of the European Parliament, also hit out at Bucharest over Romania's decision to press charges against Kovesi. Kovesi, 45, is the former head of Romania's Anti-Corruption Directorate and the preferred candidate for the newly-created EU chief prosecutor role. Tajani expressed "bewilderment" over the Romanian authorities' decision to place Kovesi under judicial control, thus preventing her from leaving the country and issuing statements to the press. He also reaffirmed the parliament's stance that she "remains our candidate, enjoying our trust and support." Romania's Supreme Court later announced that it had lifted the travel ban imposed on Kovesi and that she was now free to talk to the press. Meanwhile, Romanian Prime Minister Viorica Dancila said she was "surprised" by the different statements from the EU, according to local media. She also rebuked ambassadors saying she has "direct dialogue" with her counterparts and that "ambassadors don't make the prime minister's agenda."